Over a year after the release of iOS 6, Apple Maps has taken a significant amount of users away from Google Maps, despite the availability of a Google Maps app for iOS, reports the Guardian. Using data from ComScore, the Guardian notes that in September 2012 there was a total of 81.1 million users of Google Maps, out of 103.6 iPhone and Android users. A year later that number is down to 58.7 million, or 43% of iPhone and Android users. 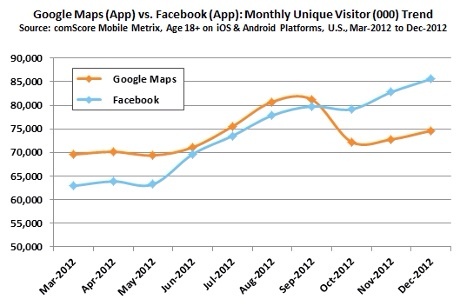 That's despite the user base growing to 136.7 million. "For the average user, even if they have the Google Maps app, they don't use it a lot," said Andrew Lipsman, an analyst at ComScore. "In a narrow window [after the iOS app download became available] I'm sure there was a ton of activity, but only for a short period." ComScore revealed that in September 2013, 35 million users made use of Apple Maps at least once during the month, out of a 60.1 million iPhone users. Based on a total of 43.2 million maps users in all, the Guardian estimates that there are about 8.3 million who use Google Maps. However, since about 2 million have not yet updated to iOS 6, the Guardian estimates that there are around 6.3 million users who use Google Maps on a monthly basis. That's a significant drop from 35 million believed to be using the service in September 2012.
iPhone Market Share in Japan Outpaces U.S.